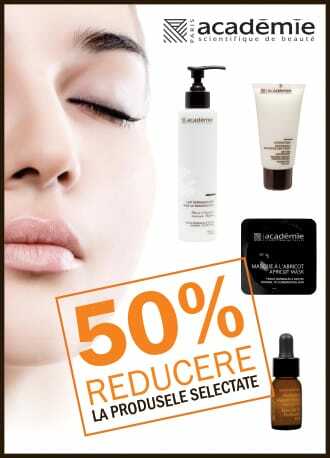 Your favorite skincare products from Academie Paris are now in a special promotion: 50% discount! Choose now one of the four products from our campaign and start this fall with a touch of beauty! CLEANSING MILK 200 ml, regular price: 126 lei, discount price: 63 lei. Emulsion for normal to dry skin. Cleans and removes make-up in one movement, leaving your skin softer. It contains water cornflowers in Drome - mallow Auvergne. NUTRITION MAJEURE HUILLE ESSENTIALLE 15 ml, regular price: 213 lei, discount price: 107 lei. Essential oils for dry skin. HYDRASTIANE CREAM 50 ml, regular price: 166 lei, discount price: 83 lei. Moisturizes and maintains hydration. To revitalize and make skin supple. Morning and/or evening, apply with light massage on a clean skin. APRICOT MASK, regular price: 124 lei, discount price: 62 lei. Relieves fatigue and revitalizes the skin for instant radiance. This one dose product is easy to use, hygienic and playful. Ideal to slip into your bag for the weekend and/or for travelling.